They're headphones! They're a boombox! Stop- you're both right! So this is actually pretty awesome- Boomphones are headphones that convert into a very portable little boombox. Billed as the "ultimate two in one audio experience", Boomphones are designed with a total of four separate speakers to deliver max sound however you need them. One pair functions as a standard headphone, while the other works to blast your tunes outward into your space. It works with a simple flick of a switch and even has some neat lighting effects to keep the party going. Boomphones have the portable power and multifunctional appeal to revolutionize the way people listen to, and share music. Designed with four speakers – two on the inside and two on the outside – Boomphones are the ultimate two-in-one audio experience, perfect for traveling, parties, exercising and anything in-between. LED lights show which mode is in action: glowing white when Boomphones are internally amplified, red when the bomb icon is pressed to blast the external speakers in boombox mode. These little powerhouses ship with a pair of cables too. One is for your music, games, and phone calls. It even has all the necessary controls built right in for those functions with an integrated mic unit that has volume control and 'push to talk' functionality. The second included cable is going to be a nice surprise for musicians on the go, as it converts the 'phones into a portable amp that you can use with a bunch of different things (though you'll need an adapter for a guitar). Pretty slick. Rechargeable through mini-USB; the Boomphones will give you a very nice 10 hours of headphone or 5 hours of boombox use, which isn't bad either. 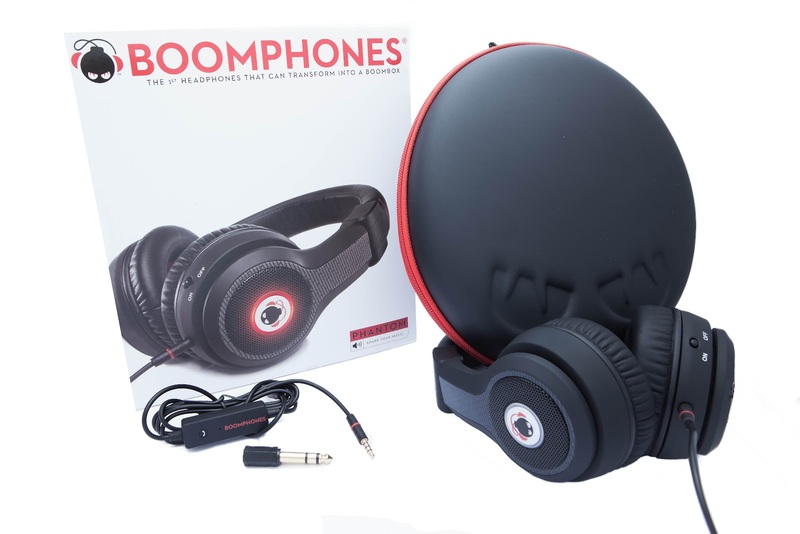 Look for Boomphones to be available on August 28th for $149.99 USD on www.boomphones.com and at other retailers (including Sportie LA) soon thereafter.